This cute flower would be a great addition to many items. Hats, headbands, bags, etc. Or it could become a hair clip or pin. It can be used so many different ways for so many things! 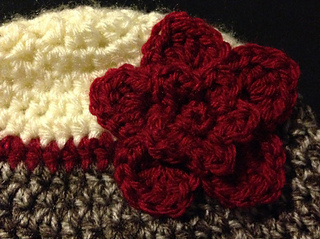 You can use any size hook and any yarn, your flower will just turn out a different size. You are welcome to sell items made from this pattern, but please do not sell or redistribute the pattern. And please try to link back to the original pattern! Enjoy the pattern, and let me if you have any corrections to it!